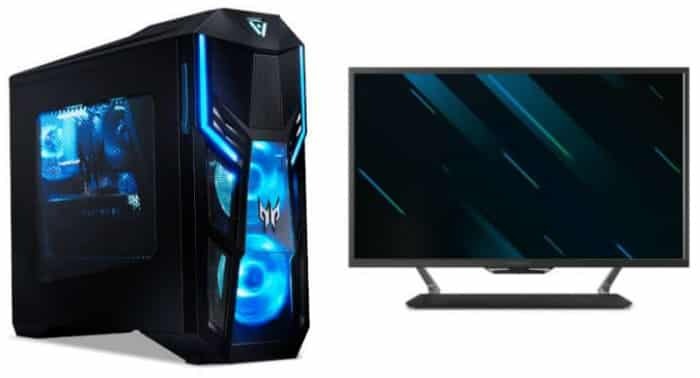 The Acer CG437KP boasts a large 4K 144Hz screen with DisplayHDR1000 specification which makes it worthy of the Predator gamer branding for enthusiasts. This model is part of a new category called LFGD or large format gaming displays which spun off from the BFGDs introduced last year. What’s great about the Acer CG437KP is it doesn’t sacrifice the cinematic capabilities of BFGDs while sitting at a price point most of us mortals are willing to shoulder. The Acer CG437KP is comparable to our beloved Philips 436M6VBPAB in design and of course, the massive size. What differentiates this model, however, is the distinct, yet subtle features the brand adds to its latest Predator displays and devices. The monitor isn’t bezel-free due to borders which look more or less an inch thick, but that’s a forgivable shortcoming since VA panels have very thick inner outlines. The gadget sticking out of the bottom bezel on the Acer CG437KP is its lighting sensor that reads the ambient lighting in your room to help the monitor compensate its brightness. This feature has been available in recent models, but there are some flaws and limitations as to how the firmware calculates the output versus a viewer’s preference. The device also carries a proximity sensor which wakes the monitor up or puts it on standby if anyone leaves or enters the room. The matte black rear of the Acer CG437KP has sharp angles that intersect to form an X and give it a unique aesthetic. There are massive vents perforated into the casing to let the innards breath comfortably. We all know by now that these new 4K 144Hz monitors run extra hot due to the significantly more powerful hardware involved. The Acer CG437KP is supported by an equally sizable stand made of metal and powder-finished in matte silver. This part looks fixed to the display without any form of ergonomics, so are going to be stuck with it. The prototype also did no show any VESA bolt holes, so mounting could be out of the equation. The Acer CG437KP is a PC monitor in every aspect so it has a DisplayPort 1.4 which is necessary for 4K 144Hz operation. However, this model is also marketed as a console gaming monitor for 4K HDR devices, so there are three HDMI slots included as well. Users will also get two USB 3.0 and two USB 2.0. USB-C is also included in the Acer CG437KP’s layout for modern gadgets such as MacBooks and tablets. 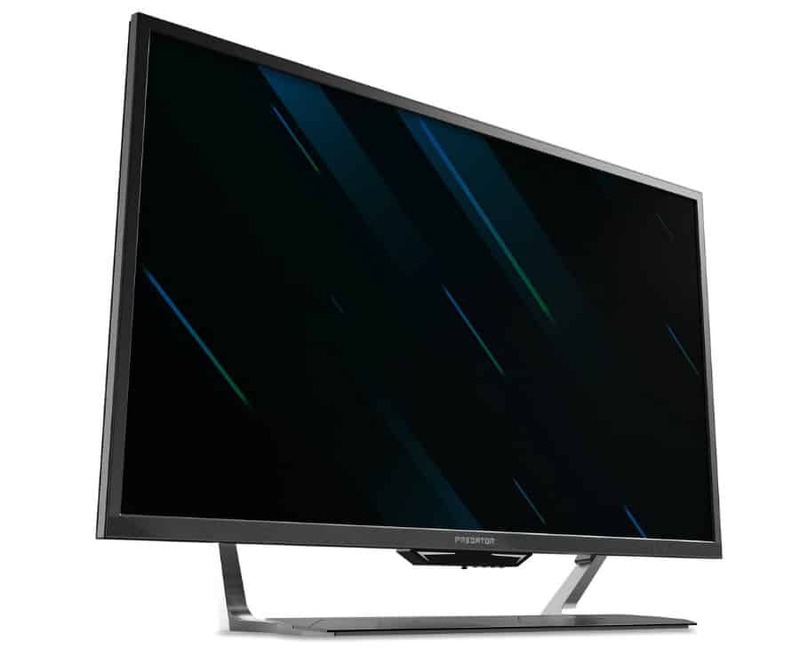 All of these features make the Acer CG437KP an ideal central display for a multitude of host devices, plus its size makes it a very sophisticated replacement for your TV. The brand also mentioned that an exclusive remote will be included in the package of the Acer CG437KP. We’re not certain if it will be as intuitive as smart remotes that act as microphones for voice commands or if it will be limited to the OSD. The Acer CG437KP sports a 43-inch VA panel with a 3840 x 2160 resolution, 144Hz refresh rate, and 4ms response time. The screen’s contrast ratio and backlight specifications aren’t listed, but this device is labeled with VESA’s DisplayHDR 1000 certifications. This ensures that the monitor has a peak brightness of 1000 cd/m2 and imaging qualities that will make it capable of true HDR visuals. The VA panel in the Acer CG437KP is capable of producing 90% of the DCI-P3 gamut with 1.07 colors. These numbers are in line with the Philips 436M6VBPAB which produced vibrant colors with excellent accuracy and definition. Couple this output with a capable backlight that has local dimming and gamers will be able to enjoy fantastic visuals for games and movies. Another characteristic the Acer CG437KP will share with the Philips 436M6VBPAB is the looser pixel density. We can say that you lose some of the benefits of 4K in rendering detail when you sit at two feet or less from a monitor of this size. That will still vary from person to person, but we think it’s more ideal to use a display like this for couch gaming. 4K 144Hz with HDR requires too much bandwidth so there will be limitations with the Acer CG437KP. The connector standard supports 10-bit color to enable the display to show 1.07 billion colors without dithering, so it’s fantastic for applications like this. However, the Acer CG437KP’s native refresh rate goes up to 144Hz, so the screen will be limited to 4:2:2 chroma subsampling. We’ve seen this on current 4K 144Hz monitors with DisplayHDR specifications like the Asus PG27UQ and Acer X27. It’s probably one of the reasons why 4K 144Hz was severely delayed since the signal input technology has to be pushed further if the engineers wanted the full range. One way to work around this limitation is to set the screen to 120Hz to enable the monitor to produce its full color. The Acer CG437KP isn’t specified with G-Sync HDR so it will most likely offer FreeSync 2 which doesn’t require an exclusive FPGA controller. Nvidia has not yet tested this model to certify that it will be G-Sync compatible, so that remains to be seen by testers and reviewers. The Acer CG437KP is an exciting new development for multi-platform gamers who want the best visuals that were usually reserved for high-end TVs before. Couple that with a competitive-grade 144Hz refresh rate and you get a stunning performance that brings out the eye-popping graphics in any type of game. LFGDs and BFGDs have growing market shares because of these facts, plus they are great all-in-one solutions for gaming rooms or setups. What’s great about the Acer CG437KP is it will not be as expensive as the X27 at release with its $1299 SRP, although it still isn’t cheap for a 4K display. The monitor will first become available in China by August of this year followed by the US and Europe by September. You can check this [email protected] page for more information regarding the brand’s latest gadgets and gizmos.